Former city slickers move to a quiet town and challenge themselves to create a microfarm with the help of their two boys. Using only the postage stamp lot surrounding the house, City Kid Farm is an experiment in urban agriculture. No, we at the farm are not taking up music. We'll leave that to folks who know how to play instruments or wait until someone teaches us the finer points of banging on the cow bell. 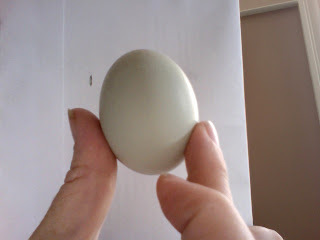 The Egg Song is the name used for particular clucking hens do when they want to tell the world how proud they are that they are either going to lay an egg or have just performed the miraculous deed. We can't say that they shouldn't be proud or want the world to know how talented they are - just imagine trying to do what they do. But we really wish they would do it more... quietly. 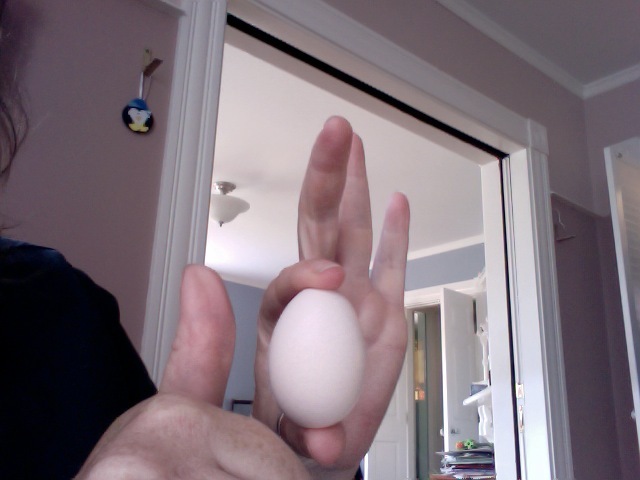 Ginger's first egg. It's hard to tell, but it's pink. When we first decided on chickens our big fear was smell. We'd visited farms and petting zoos and realized that, well, chickens stuffed in a pen and left to it smell terrible. We made the commitment to keeping our chickens clean and reacting swiftly to the first whiff of something nasty. We routinely sift poop out of the run and clean the coop weekly. We can confidently say there is very little chicken stink here. But who knew chickens would make so much noise?